Gold Shield is a unique provider of such high quality, professional services as: Secure Transportation, Executive/VIP Protection and VIP Personal Assistance. Our clients include high net worth individuals, senior executives, celebrities and dignitaries. Several of our relationship clients are included within the topmost tier of the Forbes 100 List. We are proud of our outstanding, professional reputation in this field. 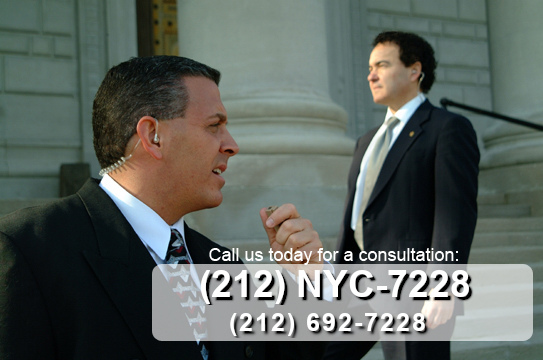 John Fiordaliso, company Founder and President, has over twenty years experience in professional law enforcement, VIP/personal protection, private security, intelligence and investigation services. Joseph Cuccia, Director of Operations, is a U.S. Marine combat veteran with over twenty years experience in such diverse career positions as: corporate executive, security consultant, executive protection specialist and martial arts instructor. Home | © 2014 Gold Shield Executive Services, Inc. All Rights Reserved.